If you’ve ever had the dream of training like an Olympic champion, here’s your chance. USA Swimming Foundation is offering a chance to live, eat and train like an Olympian at the U.S. Olympic Training Complex Aquatic Center in Colorado Springs. The fantasy camps for ages 12-17 will be October 9-12 while the adult camp, 18 and over, is October 17-19. 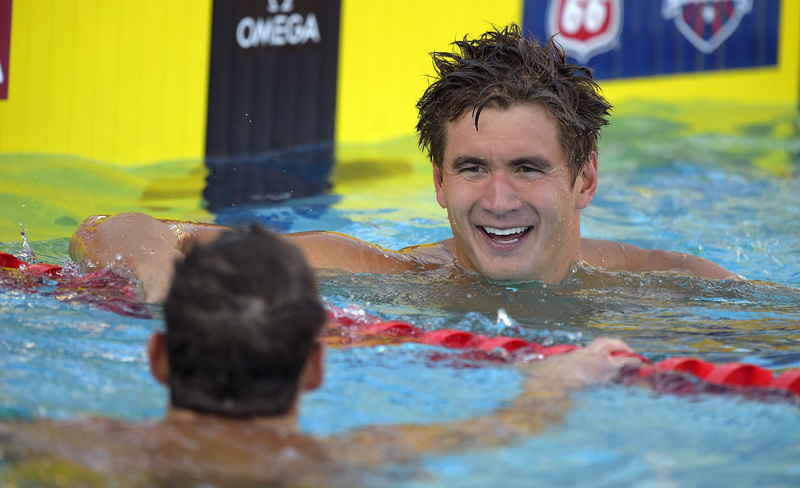 Bremerton’s Nathan Adrian, a USA Swimming Foundation ambassador, will participate in the adult camp along with Rowdy Gaines and three-time Olympic champion Debbie Meyer. Serving as head coach is Bruce Gemmell, coach to Olympians Andrew Gemmell and Katie Ledecky. The youth camp will be attended by national team assistant coach Todd Schmitz, foundation ambassador and gold medalists Anthony Ervin, Mel Stewart and two-time Olympian Chloe Sutton. The youth camp registration deadline is Sept. 3 and Sept. 10 for the adult camp. Participants will have the opportunity to enjoy workouts, workshops and interact with national team members. More information on the fantasy camps can be found here, as well as the USA Swimming Foundation. Coming off his strong performance at the Pan Pacific Championships last week, Nathan Adrian of Bremerton arrived in Singapore in advance of the Singapore Swim Stars meet Sept. 5. The meet is a one-day event that features some of the elite swimmers in the world competing head-to-head at the newly constructed OCBC Aquatic Centre. I wrote about the showdown meet in an earlier story before the U.S Nationals. Adrian said he was looking forward to the event. The competition was organized by Frenchman Stephan Caron, a two-time Olympic 100 free bronze medalist. The meet will focus on the 50 and 100 meters in all strokes. Other notable swimmers include Australia’s James Magnussen and Christian Sprenger, Brazil’s Cesar Cielo, fellow Americans Anthony Ervin, Jimmy Feigen and Eugene Godsoe, France’s Florent Manaudou and Fred Bousquet, Russia’s Vladimir Morozov and South Africa’s Roland Schoeman. On the women’s side are American Jessica Hardy, Denmark’s Jeanette Ottesen, Hungary’s Katinka Hosszu and Lithuania’s Ruta Meiluyte. The Poulsbo Piranhas Swim Team hired Jerry Johnston as its new head coach. Johnston coached for Moses Lake Manta Rays, as well as high school at Issaquah. While at Issaquah, Johnston was named the KingCo Coach of the Year as the Eagles won three straight state high school girls swimming titles. Johnson swam for Lake Washington Swim Club and swam at the University of Washington where he was a team captain and NCAA All-American. Johnson has also earned Pacific Northwest Swim Association and Inland Empire Swimming coach of the year honors and has coached numerous masters, junior and senior national swimmers and champions as well as Olympic trial qualifiers. Johnson also qualified for the Olympic trials twice. Johnson, who takes over for Patty Jenkins, will start Sept. 2. Bremerton’s Nathan Adrian made the medal podium in each of the events he swam this week at the Pan Pacific Championships at Gold Coast, Australia. Adrian started out with a silver medal in the 100-meter freestyle on the first day, and ended the meet with a gold medal anchoring the 400 medley relay to a Pan Pacs record of 3 minutes, 29.94 seconds. In between he earned a silver in the 400 free relay and a bronze in the 50 free, also on Sunday. Bruno Fratus won the sprint race in 21.44 seconds with Anthony Ervin second in 21.73 and Adrian third in 21.80. As for the medley relay, Adrian’s swim was almost anticlimactic after the lead he received from Michael Phelps in the butterfly leg. Adrian’s split time in the 100 was 47.60, proving once again how much he likes to race in the relay. It’s one of his best non-start splits and makes them the favorites heading into Rio 2016. The relay included Matt Grevers in the backstroke and Kevin Cordes in the breaststroke. Adrian said in a post-race TV interview said it’s always nice to get the lead from Phelps. Bremerton’s Olympic champion Nathan Adrian earned a silver medal in the 100-meter freestyle on Thursday at the Pan Pacific Championships in Gold Coast, Australia. Under heavy rains at the outdoor pool, Adrian finished behind Australia’s Cameron McEvoy in 48.30 seconds to McEvoy’s 47.82. McEvoy has been emerging as an elite international swimmer of late, and used the Pan Pacs for his breakout performance. Fellow Aussie James Magnussen earned the bronze. Adrian’s next individual swim is Sunday in the 50 free. He will likely be a part of the 400 medley relay on Sunday as well. Here’s a video from Nathan talking about the 100 free. In addition to making the podium, Adrian will be added to the World Championship team for 2015. The top two times from the finals at Pan Pacs after combining them with the A finals at nationals two weeks ago and the A and B finals at Pan Pacs. Nothing is guaranteed yet, especially for events that have weaker times from nationals. Also the non-Olympic distance events, such as the 50 butterfly, have already been guaranteed to the winners from nationals, according to Swimming World Magazine. With the Pan Pacs getting start just around the corner, here’s a link from a story by the Brisbane Times on James Magnussen’s back. And, here’s part 3 of the Nathan Adrian series from Team USA. The links for part 1 and 2 can be found on the Team USA page. The meet begins Thursday with the 100 freestyle slated for Friday. Nathan Adrian of Bremerton is seeded fourth in the 100 free and third in the 50 free for the upcoming Pan Pacific Championships in Australia. 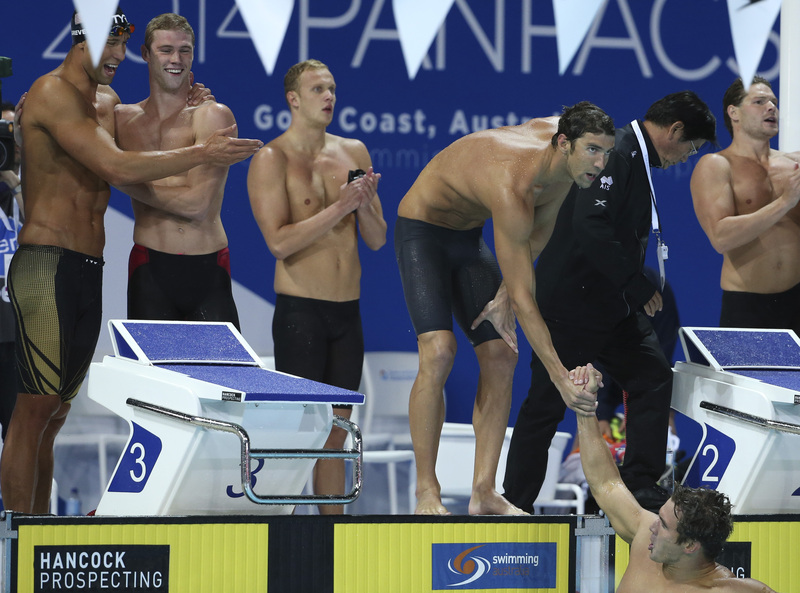 The Pan Pacific Championships begin next week in Gold Coast, Australia and the psych sheets are out. Bremerton’s Nathan Adrian is seeded fourth in the 100 freestyle, behind Australian’s James Magnussen, Cameron McEvoy and fellow American Jimmy Feigen. Swimvortek.com’s John Lohn wrote a nice piece on the match up between Magnussen and Adrian. You can read that here. I like his take on it. He doesn’t discount anyone else from winning the 100, but he does say the two favorites are Adrian and Magnussen, as it should be. Adrian is the third seed in the 50 free behind Cal Aquatics teammate Anthony Ervin and Brazil’s Bruno Fratus. Magnussen and Cullen Jones round out the top five. The 100 free is on the second day of competition (Thursday), while the 400 free relay is Saturday and the 50 free and 400 medley really are Sunday. And, if you haven’t watched it yet, Team USA has produced it’s latest video on Adrian, a two-parter from the nationals/Pan Pacs trials. You can check out part 1 and part 2 here. Both parts are quite good but I liked the part at about 2:24 when it was slo-mo and Nathan was walking out like Rocky with the towel over his head and coach Dave Durden by his side. I’m still catching up on my emails after vacation, so forgive the delay in getting this info on my blog, but Ian Lipton continues to produce as a 10-Under age-group swimmer for the Bainbridge Island Swim Club. Lipton won six individual titles at the Long Course Championships at the King County Aquatic Center on July 23-27. More than 1,000 swimmers participated in the meet. BISC finished fifth overall among 34 teams. Lipton won the 50 freestyle, 100 freestyle, 200 freestyle, 400 freestyle, 50 backstroke, 100 back and was third in the 100 breaststroke and the 200 individual medley. Also in the 10U category, Collin Bushey was third in the 50 butterfly, fourth in the 100 fly, fifth in the 50 back, sixth in the 400 free, seventh in the 100 free, and eighth in the 50 free. In the 11-12 boys category, Jude Wenker placed second in the 50 free, 100 free and 200 free, fourth in the 50 breast, 100 breast, 50 fly and 200 IM. He was fifth in the 200 breast. James Sanchez placed seventh in the 100 free, 50 fly, 100 fly, eighth in the 50 free, 50 breast, and eighth in the 100 breast. Aron Markow was second in the 50 back, fifth in the 50 breast, sixth in the 100 back and 100 breast. Max Eyrich was second in the 800 free; Andrew Witty placed seventh in 200 back. In the 13-14 boys category, Garrett Waite was second in the 800 free, third in the 100 back and 200 back, fifth in the 200 free, seventh in the 200 IM and 400 IM. Kevin Houseman finished second in the 100 breast and fourth in the 200 breast; Makai Ingalls was fourth in the 100 fly and Parker Bushey was fifth in the 50 free. For the girls, Margaret Hayes was third in the 50 fly, fourth in the 100 fly, sixth in the 200 IM and eighth in the 200 free in the 10-U category. Hannah Tonsmann, in the 11-12 category, was eighth in the 1,500 free. race. His time is always a gauge to see if he is swimming faster each time his hand touches the wall. That’s his main motivation right there. To touch the wall first. He accomplished that goal in the 100 freestyle at last week’s U.S. Swimming national championships, winning his sixth national title and in the process he put his name on the national team once again. He and his Team USA mates are on their way to Gold Coast, Australia, for the Pan Pacific Championships August 20-25. He came up just short of making it a sweep when his Cal Aquatics teammate and former Olympic champion Anthony Ervin just beat him to the wall to with the 50 free on Sunday. Nathan, a three-time Olympic champion, was second and will swim both sprint frees in Australia. In a swimswam.com video interview Nathan said Pan Pacs are a different meet than most international competitions. “Pan Pac is a little more stressful than some of the other international competitions because you have to race against your Team USA teammates and thats kind of a bummer,” he said. He was also happy that Ervin made the squad. Following his race in the 50 free in a post-race TV interview on Sunday, Nathan said another week to taper and rest will give him more speed. “It’s time to go down there and compete,” he said. Kitsap swimmers were well represented on the Pacific Northwest Swimming team that finished in second place overall at the Western Zone Age Group Championships last week at King County Aquatic Center in Federal Way. PNS finished behind Colorado Swimming Zone Team with 3,283 points to PNS 3,056. Local swimmers who competed were Amanda Ashmore and Andrew Renninger of Olympic Aquatic Club; Eleanor Beers and Alex Stefanski of Poulsbo Piranhas Swim Team; and Ian Lipton, Andrew Markow, Jude Wenker and Parker Bushey of Bainbridge Island Swim Club. Lipton was the highest finisher among locals individually, placing second in the 10U 100-meter backstroke in 1 minute, 14.01 seconds and the 50 backstroke in 35.26 seconds. Lipton was the top seed heading into the final. He was also third in the 200 individual medley in 2:46.18, fifth in the 200 freestyle in 2:26.08, the 100 freestyle in 1:08.41 and the 50 free in 31.60. Lipton was part of the PNS championship 400 medley relay in 5:11.52 and helped the 200 free relay to second place in 2:07.80. Ashmore helped PNS place second in the 10-U 200 medley relay in 2:23.31, third in the 400 free relay in 4:43.84, third in the 200 free relay in 2:07.93, and sixth in the 400 medley relay in 5:11.11. Individually, Ashmore was fifth in the 50 freestyle in 31.62, 10th in the 50 butterfly in 34.77 and 13th in the 100 freestyle in 1:11.64. Renninger placed 15th in the 10U 200 freestyle in 2:37.29 and the 200 individual medley in 2:55.52, and 19th in the 50 backstroke in 39.05. He also helped PNS finish eighth in the 400 free relay in 4:57.47, 10th in the 200 free relay in 2:15.47, and 10th in the 400 medley relay in 5:39.57. Beers finished eighth in the 11-12 division in the 100 free in 1:03.90, and 13th in the 50 fly in 31.63. In the 400 medley relay, Beers helped PNS place second in 400 medley relay in 4:40.15, third in the 200 medley relay in 2:07.28, fourth in the 200 free relay in 1:56.52, and fifth in the 400 free relay in 4:17.74. Stefanski placed 13th in the 11-12 100 breaststroke in 1:20.55 and the 200 breast in 2:57.62. Markow placed fourth in the 11-12 50 breast in 34.40, 13th in the 50 back in 33.54, and 14th in the 100 breast in 1:20.72. Markow also helped the 200 free relay to eighth place in 1:56.73, and the 400 free relay to a ninth-place finish in 4:22.13. Wenker placed third in the 11-12 200 free in 2:12.09, fourth in the 50 free in 27.68 sixth in the 50 breast in 35.88, sixth in the 100 free in 1:01.64, seventh in the 200 breast in 2:51.83, and ninth in the 100 breast in 1:18.32. He was also part of the three winning relay teams, the 400 free relay that finished in 4:02.94 the 200 free relay in 1:50.41, and the 400 medley relay in 4:29.37. The 200 medley relay placed third in 2:07.36. Bushey helped the 13-14 400 free relay to a first-place finish in 3:44.36 as well as the 200 free realy in 1:41.42. He finished 14th in the 13-14 100 free in 56.99.